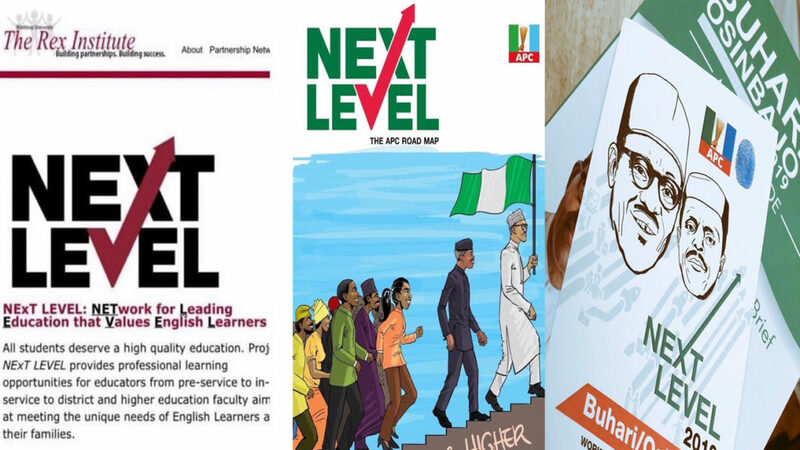 Nigeria’s ruling party, All Progressives Congress, Tuesday clarified allegations that its #Nextlevel campaign logo was a plagiarized version of Rex institute’s education program logo. “Look at the #Nextlevel, it is totally different from what they are showing, Look at our official logo released,” said Buhari’s Campaign Organisation spokesman Festus Keyamo on AIT. “They went to steal a logo crafted it as if it is our won and put it up on the social media. fraud!” he added. Although the font of the APC logo is similar to that of the school’s project logo, the arrow ascended from the X in the ‘Next Level’ of that of APC. which is different from that of the school’s which has the letter ‘V’ in ‘level’ merged with X in ‘Next’ with an arrow extending from it. Keyamo alleged that the supporters of the opposition People’s Democratic Party are the mastermind behind the ‘pseudo’ logo circulated on the social media. But this is not the first time the president will be accused of plagiarism.